The “Annual Day Zero HiF Advent Calendar Kick-off 2016” is a Send-Off this year - Happy holidays! I really missed talking to you. Twelve months is a long time of radio-silence, and I have a lot to tell you. Like all the awesome trips I have been on this year, from Ski-touring in Lyngen to backpacking in the Dolomites, 2016 has been fantastic. I spent great moments with my family in the mountains, and am looking very much forward to winter backpacking and other adventures. 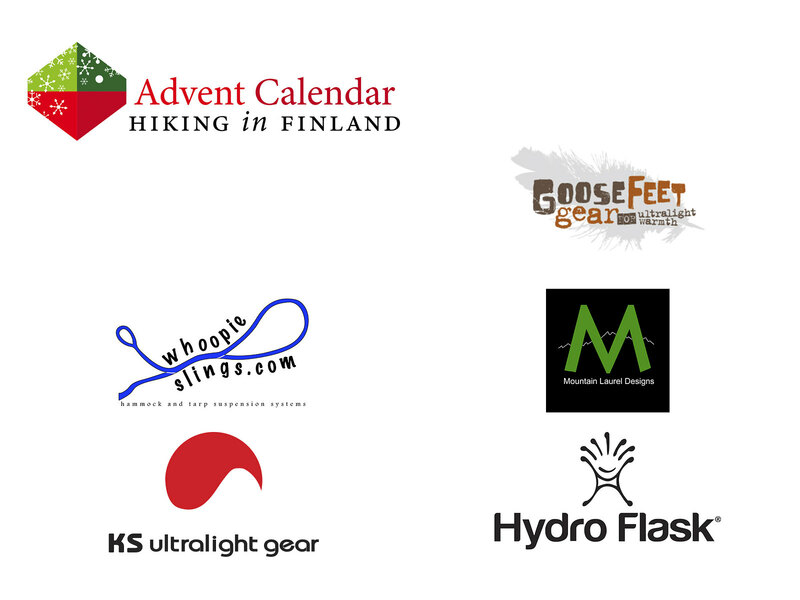 But lets get down to business and start talking about the holiday season and the awesome Hiking in Finland Advent Calendar. I saw it was again very nicely filled with prizes worth over 5.000€, and what better way to celebrate an awesome #HiFAdventCalendar season than with a sweet ADZHiFASO package from some small companies! whoopieslings.com make a complete Hammock and Tarp Suspension Systems, and as I decided to give hammocks another chance what would be better than having a smart suspension system for it? A set of 6” whoopie slings, a pair of 6’ tree huggers and a pair of toggles should make setting up my hammock a breeze! Similar to hammocking I think it is time to step up my trailrunning again! A VRV8 Pack from KS ultralight gear would be ideal for that - the pack is super simple yet efficient and packs all I need for a day out running in the forests and hills. It carries my poles, soft flasks or water bottles, and 8 l of gear fit into the main compartment, all with restricting movement. One thing I have learned which should always be along is a pair of rain mitts. The Mountain Laurel Design eVent Rain Mitts are the lightest rain mitts on the market and rumour has it that if one carries a pair rain usually doesn’t bother one when outside, so they’re kind of a good charm, too! Also a pair of GooseFeet Gear Down Socks have been on my list for a long time - not just because I get awfully could feet at camp in winter, but also because they pack so tiny & light when I’m hiking throughout the day. Filled with 850 fill power DownTek down these socks keep me toasty on my winter adventures, which is especially great after a long day in boots! And finally, a 32 oz Wide Mouth Bottle from Hydro Flask would be swell - not just for plenty of coffee the whole day but also for keeping drinks cold in the heat. It is BPA-Free, Toxin-Free and comes with a Lifetime Warranty - so this would be the last bottle I’d ever ask for!